Guides: saw alignment, maintenance, safety -2º to 47º 25" / 12" 60 lbs. / 42 lbs. A dog might be man’s best friend, but running a close second has to be a good table saw. Come to think of it, a dog isn’t much good on a job site, so maybe for you, that table saw is your best friend. Regardless, a table saw is a very useful power tool to have on the job site. You want your table saw to be high quality and portable, and the Bosch 4100-09 10-inch Worksite Table Saw is that and more. You’ll need to buy your own saw blade, most likely, because mine did not include a saw blade in the box. That didn’t bother me one bit, though, because I typically use a higher quality blade than manufacturers tend to ship with a new saw. Assembly of the Bosch 4100-09 is easy and quick, really just a matter of installing the rip fence, miter gauge, and smart guard, then putting in your blade and attaching the saw to the gravity rise stand. I had my table saw up and running within 30 minutes. 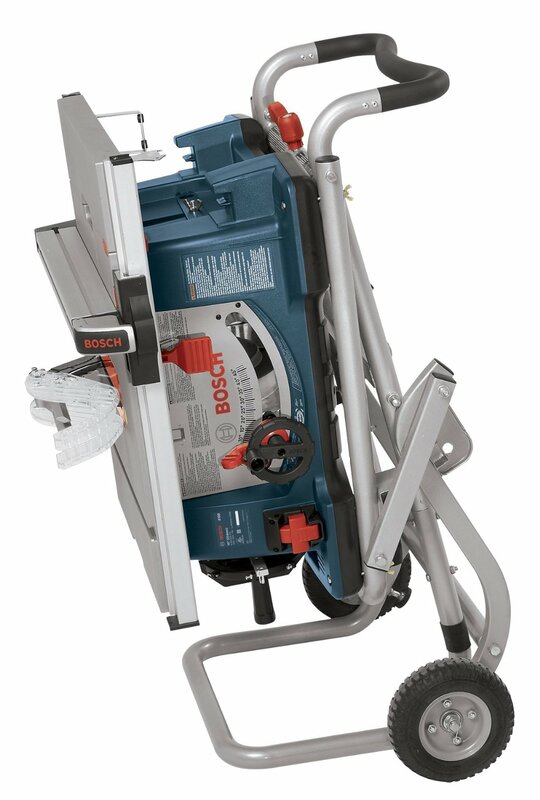 The Bosch 4100-09 features a 15-amp motor, so it’s powerful enough to rip through some of the hardest hardwoods around. 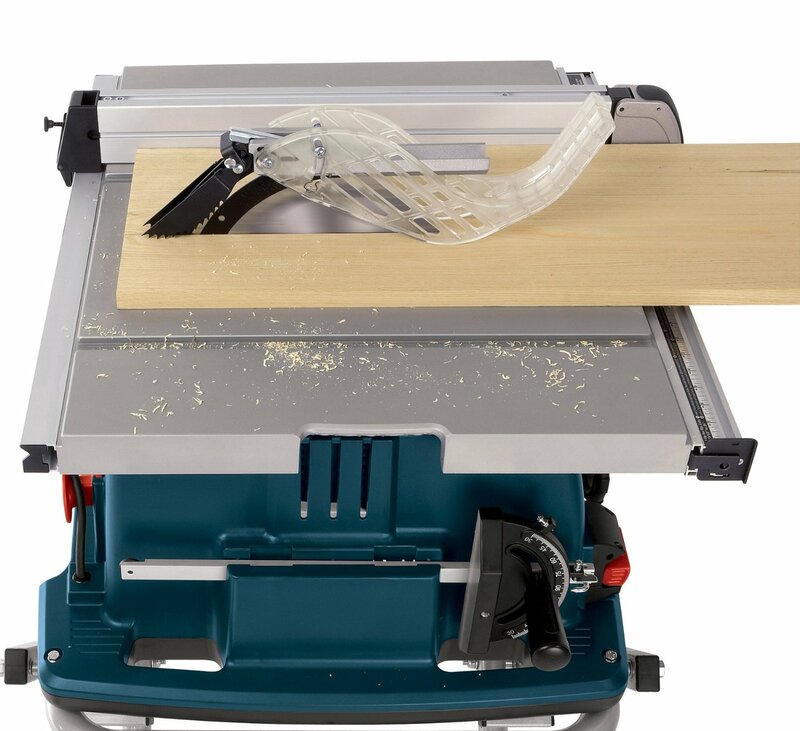 The large cutting table will accommodate ripping wood up to 25 inches wide, allowing you quite a bit of ripping capability for such a compact table saw. The Smart Guard system helps protect you while maintaining your ability to see what you’re cutting, ever important when ripping or cutting wood. This system includes a built-in riving knife, a blade guard, and anti-kickback pawls, which install quickly and without the need for any tools. The built-in riving knife can pose some problems, though, if you use a thin-kerf saw blade with this table saw. Any blade with a kerf of less than .92” is liable to bind up with the riving knife, so make sure you stick with blades that have more than .92” of kerf. The Squarelock rip fence works wonderfully, staying true for terrific accuracy with every cut. It is easy to adjust, even one-handed, and locks in place right where you want it to. The only problem is that it sometimes works its way loose, and doesn’t always stay locked in position. Take your time, check the accuracy, and recheck the fence to make sure it’s straight aligned, and you should be good to go. My favorite feature, though, is the gravity-rise stand. This stand is a wonderful accessory, since it folds up very compact for storage and transportation with the saw attached, also providing you with an easy way to move the saw around from your truck to the job site. This is pretty important, because this saw tips the scales at 99 pounds. This saw is rock solid as far as durability goes. All of the parts are well-made, and I’ve used my Bosch for hours of cutting without any major problems. The motor starts right up when it is supposed to, and the gravity rise stand has held up to virtually miles of transport between job sites. The finish on the table is quite good, and still shows no signs of marring or scraping. I’ve dropped this thing a couple of times, and it takes the beating and keeps on running. 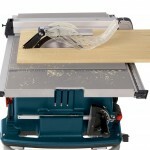 This table saw is very easy to use, with some minor exceptions. The aforementioned problem with thin-kerf saw blades is one thing to watch out for. You should also be mindful of the miter gauge, and consider replacing it with an after-market miter gauge. The miter gauge that ships with the saw tends to fit pretty sloppily in the slot, and its accuracy is less than satisfactory. While I wouldn’t recommend a child using this saw, the gravity rise stand is so easy to use a child could lift the saw up and lock it into place. This stand is really nice, once you get used to the saw sitting about 3” taller than most table saws. The pneumatic tires on the stand, while nice, could stand to be a bit bigger—they won’t handle going over stairs without dragging the metal tubing across the stairs. 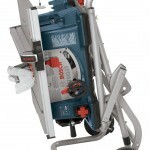 The Bosch 4100-09 table saw is backed by a 1-year warranty. Woe to you if you need it repaired, though, because the Bosch-authorized service centers are few and far between. I’ve seen better table saws, and I’ve seen worse. For the money, the Bosch 4100-02 is on par with the rest of the industry. It’s nicest feature, the gravity-rise stand, is unparalleled as far as ease of use and usefulness as a cart. It would be nice if Bosch used bigger, solid wheels instead of pneumatic wheels, though, since the wheels are not much use going up stairs. It seems the riving knife could have used some more attention, too, to prevent the binding problem if you happen to want to use a blade with a thin kerf. If you’re interested in purchasing, make sure to check out Amazon.com’s current price on this saw.